Excellent summary and excellent questions Hodge 69.We are faced with yet anther Tokai mystery and a very interesting anomaly.My opinion is that both the pickguard and it's unstamped grey backed pickups are despite the pickups very unusual conductors, original to both this pick guard and to this guitar. Hiro takes the opposite point of view and calls my opinion BS which is his right to do so, but I think that my record regarding the identification, observation, and hard won knowledge regarding Tokai strats, particularly Goldstars, which when I joined this forum, very little was known and my generally good humoured and helpful contribution to this forum and it's members is more than a little bit rude, especially in comparison to the rather meagre nature of his contribution and knowledge regarding Tokai Strats. So I admit I was a little bit stung and retaliated,mea culpa .However as I have already pointed out, all of my hard won knowledge regarding Tokai strats, does not guarantee that my opinion on this particular mystery is correct.My opinion may be no more than hunch and that hunch could well be wrong. Hiro`s scepticism regarding the authenticity of of this pickguard may be right,because as we have all observed , even a broken clock is right twice a day The truth is that we may never know the real origin of this pickguard and its pickups, or we may stumble across something years later that throws some light on it.That is half the fun of being a member of this forum and of being a Japanese Guitar buff in general compared to being an American guitar buff.So much is already known about Fender and Gibson whereas our knowledge of Japanese guitars is still growing all the time.New discoveries can still be made by any of us here and new information is still being uncovered.We still have years of fun(and argument) ahead of us! So it seems a little "cat amongst the pidgeons" here . . .sorry. Bluejean > I buy roughly 20 Tokais a year from Japan all made before 1985 for the Aussie guitarists and in 30 years of being intimate with hundreds (maybe even thousands) of Springys (1977 - 1982) and Goldstars (1983-1985) I have never seen this configuration - especially in a 1981 model. What I can say with utmost assurance is that the Japanese market is wrife with changing parts to individualise their guitars. I have seen plenty where scratchplates, pots, selectors, machine heads, pickups and even bridges have been swapped out for whatever reasons. What I shall say to you is this - I have no idea how Fernandes set their electronics and the point you raised about their use of Goto was very good. It may be that a Fernandes loaded scratchplate has been swapped into the Tokai guitar. No proof, just a theory. . . and also the 'A' and 'B' plates stopped around the introduction of the 3-ply 11 screw 'plate introduction [ Mid -1980 I believe, around S# 0009600]. Whilst I recall only ever seeing them on 1 ply 8 screw style, I could be mistaken. ..actually IMHO, this is a bitsa . . .I would place it as a 1984 ST-55 MGR with modified bridge and "foreign" electrics and 1981 neckplate. Went through my book and realised that MG (Metallic Green) was never offered as a finish until 1983 Goldstar - so it could never be a Springy Sound. Also the headstock logo reads" Original contour body", not "Oldies but Goldies". . . a touch of Fender. Great info Peter,thanks for that. If I am going to have to eat humble pie then I am more than happy that you are the chef,but I am not quite ready to yet! You state "Went through my book and realised that MG (Metallic Green) was never offered as a finish until 1983 Goldstar - so it can never be a Springysound, also the headstock logo reads" Original contour body", not "Oldies but Goldies". . . a touch of Fender. "Well the neck is very definiteley a lam board Tokai, and both body and neck codes are a reasonably close match (although experience proves that they do not necessarily have to be so to be original),there can be no doubt about it that,so far so it's it's not a partscaster. And would I be wrong in thinking that one of the colours offered on the ST 65/64 Springy from the 1981 German catalogue that I have provided a link to is is MGR ..... ie .Metallic Green?and the pickups fitted to this Tokai ST 65/64 from the 1981 German catalogue are listed as being ST Vintage i.e. Es, are they not?So it seems that an 81 Springy in MGR fitted with Es and with a 1981 serial number neck plate is not just a possibility or a fairy tale, or necessarily a partscaster but a very definite reality,it was actually in production,the 1981 German catalogue proves it.It is in fact guitar number 4 in the photograph. It would seem the whole guitar is pretty much molested, if your theory is correct, and by what we have seen so far, the example does look to be a 'partscaster' of sorts. Your knowledge for these guitars is extensive; glad to see you are not tooting your own horn as some folks do on forums. I never thought for a minute the pickups are Es. I never thought for a minute the pickups are Es.". I would hold your horses before you start gloating dude!This ain't over yet!Read my post P.S.What flavour of humble pie do you like? Thanks for the kind comments . . . I do own 2 old Fernandes catalogues from 1982 and 1985. In both they have an ST-80 equivalent and those FST-80's used an "E" equivalent pup. It may well be these are Goto wound 'E' for Fernandes - it still makes them an E ; just with a different skin - again a theory. http://www.strat-talk.com/threads/ngd-mint-1981-tokai-springy-sound.456372/page-2 Thanks for your thoughts Peter,it seems to me that when faced with such a mystery all we can do is theorize,piecing together what bits and pieces of info that we can gather together and sometimes we must have the guts to stick our Tokai necks out!.What do you think of the MGR ST65 Springy illustrated in the 81 German catalogue by the way?Sometimes guitars were shipped to Europe that may not have reached Australia or the States. I am inclined to believe that this is the guitar that we have been trying to identify. I still think that both the A stamped pickguard and the unstamped grey backs are Es and they are original to this guitar,and This I believe, is Aroomstudio's new baby.You might well be right about the Fernandes Es .A lot of early Fernandes guitars were indeed built by Tokai and the pickups may have got mixed up in either the Gotoh factory or in Hammamatsu, If it is the MGR St 65 Springy illustrated in the the German catalogue #Springy number 4 ,then it is a very rare beast indeed!This link provides a clearer photo of the 81 German catalogue.From what I know,the Di Marzios mentioned in this catalogue are the imported black backed VS 1s sometimes found with the PAF paper stickers and sometimes not. What the German catalogue calls St Vintage pickups are usually 5 plus ohms,like the pickups on The MGR Springy that we are discussing and are in fact Es. The slightly overwound St Hots,typically 6 plus ohms are in fact what we would call Us. All the best Gabe. OK guys, . . .
expanding on my last post and after reading Gabes notes I took his advise and triple checked my database and surprised myself in doing so. I still stand by my comments that the loaded scratchplate is not original to the body+neck and now I am 100% sure after my findings. The serial number of this guitar is 1022688 ST-65 MGR, of this it is clear. 1981 Serials started around 1013000 and went through to 1025500 (give or take a few 100) In late October 1981, some changes occured. The Model Year became 1982. Serial numbers were still 102xxxx until December 1981 but features changed. For this discussion the primary ones were the moving of the date stamp from pickup cavity to control cavity and the cessation of 'A' and 'B' stamped scratchplates. This occurred around Serial# 1021800. Every scratchplate I have seen prior to this and after this Ser# ALL have White/Blk wiring on 'E' and 'U' pups. So, yes, MG was offered as a colour before 1983 in Europe ( but not Japan. Australia or USA) but only for MY82. The body stamps are 11=3 so a November 1981 build again MY82. 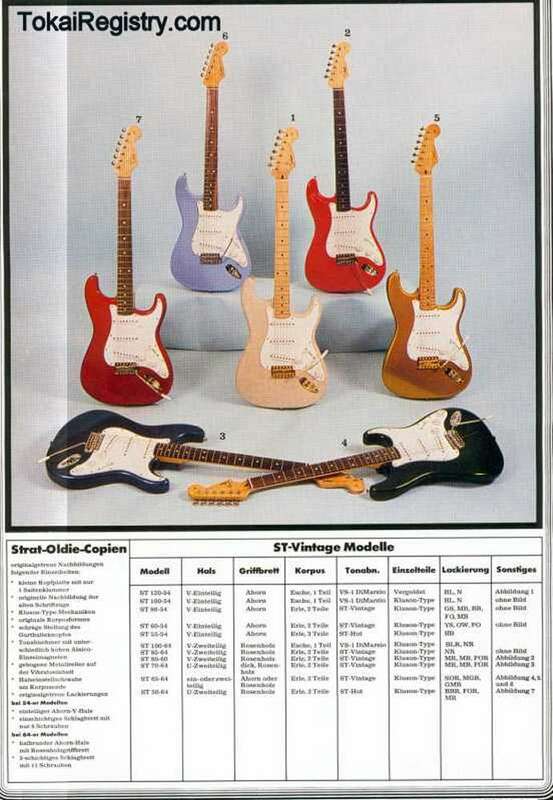 Catalogs: I took the liberty of examining the rest of the pages from the German catalog to which you refer and found it to be a 1982 Catalog - check the headstock inlays on the ES and LC models . . .1982. Hope this satisfies all parties involved, thank you - I need a drink. Good on you for that info Peter....................So the guitar is as I thought, a 1981 MG ST 65 Springy not some tricked out 1984 Goldstar with a fake neck plate which you originally identified it as being. According to the published specs this guitar should be fitted with ST vintage E pickups and it is significant I think that the unstamped pickups fitted to the guitar we are discussing conforms exactly to those E specs in terms of ohms and construction. In addition the scratch plate of the said guitar has an A stamp which is associated with E pickups albeit of a slightly earlier time frame,so the plate could well have been left over from an earlier production run.The wiring I agree is very wacky and I will admit have never seen this particular wiring on ANY strat pickup from any manufacturer from ANY country. Strangely enough this makes me even more convinced that it is not a fake.Why on earth would a faker wire up a set of pickups in such away that resembles absolutely nothing else on earth and which would immediately draw attention to its uniqueness and hence its authenticity? No....any faker would have followed the standard ,black white conductor wires that Fender used and that we all know and love.These pickups have been made by Gotoh in my opinion,nobody else was making these greybacks in Japan at the time and they may well be some prototype wiring system that were trying out,perhaps to save time and money in the production process and quickly dropped,perhaps when they realised what a conservative bunch us Strat fans are. So I'll join you in that drink.Make mine a large Lagavulin(and maybe we could order a slice of pie and an Irn Bru for Hiro)! As I have made clear I think that you are wrong about that scratchplate not being original , but the world would be very boring if we all agreed about everything though wouldn't it Peter! Cheers ,to your very good health! from Gabe. Your knowledge for these guitars is beyond impressive. I believe the 6th photo (006) is showing serial # 1022792 but I could be wrong. Seems to be the only pic of the neck plate in which the serial # is not blacked out. By the way i ordered the guitar from Japan on Buyee, So, I would say the guitar sold in Japan and stayed in Japan until two weeks ago when it came here. that's my bad. I couldn't make the serial out properly but do have an ST-65 MGR listed in my database with serial 1022688 so thought this must be the same one. Now I have 2 x MGR ST-65. ...and I still don't believe the pups are correct ! Yeah, I have no idea what is going on with the PUs. I actually ordered some boutique PUs for the guitar as I have been wanting to try those ones out for a while. I also ordered a brass tremolo and Callaham plate and saddles. This guitar is going to be really good once all that stuff gets set up. As for people marking out the SN of stuff they are selling. I heard years ago people did that for stolen goods. People would do that with high end mics they stole. Like u47's etc. But when they did that they scratched out all of the SN not just part of it. I see sellers doing this everywhere though so it must not be this. There is this thing I have seen a lot in Japan though. Say some guy is selling a guitar in Tokyo for $1000 but only ships to Japan. Multiple people on Ebay and other sites list the guitar at $1700 or so. So, you will see the same guitar for sale from 10 different sellers. I think this may be why people do this. But I bought the guitar right from the source and paid Buyee to freight forward it to me in the States. concealing serial numbers to me is sketchy; IMO it implies someone has something to hide. If that is the case, then what are they hiding? Having said that I have purchased from Ikuo previously, although that was many years ago, and he seems like a very reputable seller. He always seems to offer very detailed item descriptions which is IMO a plus; many sellers don't do that. I sold several guitars & two amps before I was 20 years old, have sold tons since then, and have never once concealed serial numbers. Maybe I'm just old skool. (partly) concealing serial numbers (on authentic/vintage guitars, mostly the 'big name brands') is also done to not give fraudeurs easy acces to replicate it on fake guitars. Personally I have never hidden a serial# on guitars I put up for sale.